Photos from along the length of the flood control channel highlight the diverse character of the channel as it works through braided meanders near Niles Canyon (top left) to the channelized flood control channel that flows into the Bay near Eden Landing (bottom right). Conversations and mapping with local agencies helped us to gain an understanding of the systems that define the sediment-shed. 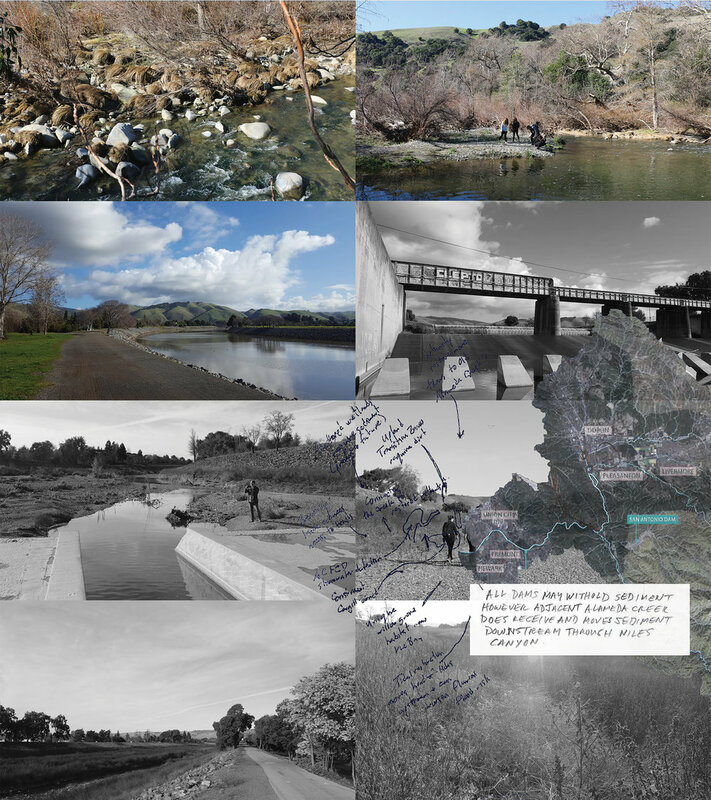 In Phase II of the Resilient by Design Challenge, our team has continued to research the impacts of climate change to the Bay - with attention to the ecological history of Alameda Creek watershed. The San Francisco Estuary Institute’s Historical Ecology report has provided us with a comprehensive starting place for understanding the 700 square miles that define the systems that created the diversity and patterning of Alameda Creek watershed that continues to serve the Bay’s inhabitants today. From the Coastanoan Ohlone shell-mounds along the Creek to the salt ponds that define the tidal marshes, the watershed has been modified to serve human needs from the earliest human occupation. "Farmers learned the flood patterns of Alameda Creek, and used the overflow across the Niles Cone as a valuable deposit of fresh soil. Brick makers mined the fine clay deposits along the lower reaches of streams to make their bricks; gravel miners extracted gravel from the coarse gravelly deposits further upstream." As the report notes, among the most significant modifications to the watershed is the transformation to confined streams, incised channels, drained wetlands, reservoirs, and diked tidal marshlands. Enter Alameda Creek Flood Control Channel - photographs below were taken on our most recent trip down to Alameda Creek in late January, 2018. Besides the several resources we use within the office—maps, historical records and books amongst other sources of information—a hands-on understanding of Alameda Creek and its public is imperative to the development of ideas and strategies. We aim to complement our ‘on-land’ surveys with trips in and around the 12 miles of channelized creek, learning from people living within high-risk flooding areas, landowners along the channel, and agencies and disciplines that integrate to create long-term resilience in the creek watershed. Our first Stakeholder Working Group meeting was the beginning of a conversation engaging multiple agencies and research groups working to discover the interconnected ecologies of SEDIMENT, PEOPLE, and FISH. Additional meetings with researchers like Rohin from the Alameda County Flood Control and John from the South Bay Salt Pond Restoration Project have provided valuable insight into the opportunities for sediment movement through the channel. With sediment deposits coming from the more textured and naturalized Niles Canyon area to the West, downstream barriers that limit fish passage also block the transport of critical sediment for building wetlands in the Bay. While the Creek and sediment within have been of primary focus, we also included visits to neighboring entities like LEAF, a local garden in Niles that seeks to build resilience through collaborative teaching and community dialogue. A visit to the Waste Water Treatment Plant led us away from the Creek and deeper into the historical ecology of the Niles Cone - following the historic flows of Old Alameda Creek downstream to Eden Landing. Reconcieving the Alameda Creek Watershed as public involves thinking big and long-term, but acting now, developing implementable projects and policies that set us all on a path to a resilient future. We’re excited to embrace new and creative ways to engage the public in the design of the Alameda Creek sediment flows. Stakeholders met on January 26th in Hayward at the Alameda County offices to discuss the Phase I project proposal for Alameda Creek watershed. Bruce Cates from LEAF showed us their upcycled stage made from out-of-use doors that they use for hosting events, their hugelkultur mounds for growing, and spoke to us about their relationship to the Creek and its history as the site of major cross-country and inter-Bay commodity and commuter transportation. At our visit we met with Paul, who gave us a tour of the bio-solids processing operations that inside, gave us a view of the massive centrifuges, and outside, offered views out to the former salt ponds with remnants of the duck hunting cabins that still dot the ponds. RSVP for the Creek Crawl!